Hi there, hope you're having a good w/e, despite the rain (well, rain here in London)! What did you all think of it? I'm generally not a massive fan of Nigella's TV series but we watched the first programme of At my Table and OH recreated her chicken traybake with peas and leeks last night, and it was delicious. The only disappointment was that the chicken skin didn't really crisp up, but the pea/leek/dill combo was excellent. 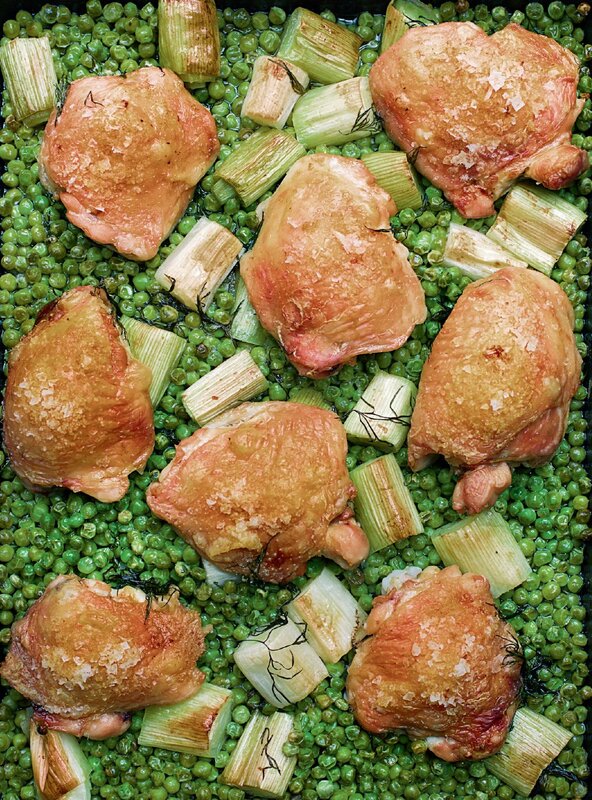 For those of you who didn't see it, it was incredibly simple: a packet of frozen petits pois, sliced leeks (we did one for two of us), crushed garlic, dill, sea salt, all mixed up well, then sit your chicken thighs on top, sprinkle with sea salt and some olive oil. She also poured some Dry Vermouth over the peas and leeks - we used some open white wine. Garnish with more dill to serve. I think that was it! Someone please correct me if I've left anything out! We gave ours more than an hour - I think she said an hour and a quarter for her tray with about 8 thighs. She didn't say what temperature, we did 160 degrees on a fan oven, which is 180 equivalent. Maybe we should have done them a bit hotter to get crispy skin. She said that the steam coming off the frozen peas would crisp it up. I watched this today and couldn't tear myself away! I always watch Nigella when she is on, went through a period where she irritated me a tad a few years ago, but today I realised what I like about her shows. I think she has a perfect way with the camera, her use of the English language is adorable, and not only does she show new and traditional recipes, but she also elaborates on ingredients that you may never have heard on and substitutes if you can't get hold of them. I think you have described the pea and chicken bake spot on. I think I read on here somewhere (cookery show fatigue?) a remark about it that made me think, here we go! But I think it looked quite nice. I also like her delicate table settings. Looking forward to the next one. Oh, I also thought her dress was gorgeous! The recipe is here KC2. Took a bit of finding. Loved Ozzie Osborne's confusion on Gogglebox last night ... "turkey eggs?" Yes, that would be a good use of my chicken! And those Turkish eggs looked a bit weird to me too. I am not keen on a big bowl of slop and that is just what it looked lime. I missed the reference on Gogglebox. Love the Osbournes for entertainment value so will seek that out! We usually do Yotam Ottolenghi’s recipe for Turkish eggs, but have gradually simplified it. The raw garlic in the yoghurt wasn’t very pleasant, so we use garlic bread, or garlic pizza, as the base. Then top with the wilted rocket/spinach, then the poached eggs. Serve with plain yoghurt and the spicy butter sauce. Very quick and very easy. I fancy trying the traybake soon too. Pepper Pig wrote: The recipe is here KC2. Took a bit of finding. Thanks so much pp - it looks as if our oven was a tad low as she says 200 degrees, so we'll do 180 fan next time. And well done for finding it! Just to say, OH made it again last night and with the higher oven temp it was super crispy. A great recipe. We quite enjoyed last night's programme, the icecream cake and the sandwich looked nice and straightforward! KC2 wrote: sandwich looked nice and straightforward! I liked the look of the ice cream. The sandwich .. do you like sandwich with your butter? earthmaiden wrote: I liked the look of the ice cream. I have just watched last night's offering. I think she excelled herself ... I longed to eat every last morsel! Lamb, potatoes, prawns, mousse, cake .... it all looked delicious. i was salivating over the carrot cake- it didn't help that i was doing a fast day. Which is the standard version in most people's eyes ? i have the ingredients (although not the cream cheese - but that is easily rectified) and it's not a fast day, today. i did like the way she did the ginger juice for the icing; i haven't seen that done before. Did you notice that the prawns were cooked without de-veining? the veins were clearly visible. I've noticed before that she doesn't bother. I can verify that coconut crumbed deep fried prawns are the food of the gods...........it absolutely works. I had it (on more than one occasion) whilst holidaying in the Southern US states. earthmaiden wrote: I have just watched last night's offering. I think she excelled herself ... I longed to eat every last morsel! Lamb, potatoes, prawns, mousse, cake .... it all looked delicious. Thanks for the cake link, scully, ginger and walnut definitely a great mix. A propos ginger, I had some delicious "ginger water" at a German friend's once, simply chunks of peeled ginger steeped in boiling water before cooling and drinking. it was gorgeous. I've always had the layered version, and when I last made it eons ago, that's what I did. I can't remember what recipe I used but I'd always thought to use Nigel Slater's if I do it again for lots of people (https://www.theguardian.com/lifeandstyl ... nk.recipes), that was, until I saw Nigella's and that definitely is the way to go now! Can't wait to get a load of walnuts on my next Lidl shop. Haven't got any left atm. I've never deepfried anything, and delicious as they looked I'm far too wary of deep frying I fear to ever try them. Busybee wrote: I can verify that coconut crumbed deep fried prawns are the food of the gods...........it absolutely works. I had it (on more than one occasion) whilst holidaying in the Southern US states. I've never eaten it as a layer cake - just as a tray bake or loaf - and I don't usually use cream cheese frosting either. Nigella's version with large lumps of ginger looked really good - I've already saved the recipe for sometime in the future, when I need a large cake. In an old fashioned cookery book I have a recipe for carrot cake which is what I call a syrup cake which contains carrots and certainly doesn't have icing or anything. It's not bad but nothing like American carrot cake. I first had the American-style carrot cake when a girl at work circa 1992 used to make them. We had never seen them before and always asked for one for special office occasions. It was a sandwiched cake well filled and covered with a cream cheese frosting but not to the degree that people smother cakes these days (I think the cupcake phenomenon was the start of stupid amounts of icing). We had a sandwiched Costco carrot cake at work the other day and the amount of icing was ridiculous. I thought Nigella's looked very interesting flavour-wise and I too was interested in how she extracted the ginger juice. With a little less frosting (even if sandwiched) it would be delicious I think. As for the coconut prawns. They looked wonderful, but I like desiccated coconut. I had fish with a Macadamia crumb coating in Australia and that was sublime. I imagine this as being a similar kind of thing. How did you feel about leaving the veins in? It's becoming a bit of a "thing" with me. Gruney wrote: How did you feel about leaving the veins in? It's becoming a bit of a "thing" with me. I would certainly prefer then deveined - I didn't notice it on the programme but hope that they were purged. I would certainly check and act accordingly if I were making them. I'm afraid don't know about "purging", but the prawns were thrown in straight from the packaging - and,as I've said, the black veins were clearly visible. Hey ho - each to his/her own, I suppose. I only saw the 'veins' on the underside or inside curve of the prawns. I thought the intestinal tract was down the back/outside curve and that the inside 'vein' was somehing to do with the nerves/nervous system and not required to be removed? All of this week's food looked delicious, I thought. Ah - I didn't know that EmWilk. Thanks very much - I can go forward with a lot more confidence now. Toothpick scraped gently. I'm not particularly bothered but was hugely disappointed to once be served a starter of headless prawns but tail etc intact. The heads are one of the best part and I love the roe. Luca wrote: The heads are one of the best part and I love the roe. I have now caught up with this week's programme and have noted the recipe for her carrot cake ... I have all the ingredients apart from the cream cheese, so that will be rectified this week-end ! i'm waiting for the cake to cool, at the moment, before i put the icing on. i took your findings, patsy, and added a little more ginger (100g of the crystallised and an extra half teaspoon-ish of the ground - i rather over chopped the crystallised in the food processor though). i cooked it in a loaf tin rather than a round one and as it said bake for 45-55 mins i put it on for an hour as the shelf in my oven is (either high or) low-ish. it went back on for another fifteen minutes as the skewer said it wasn't cooked in the middle. the icing didn't turn out runny - in fact i put extra ginger juice in with no ill effect. i'm not sure how much longer i can wait for it. I have just watched this week's programme (from yesterday). I think she is excelling herself in this series - I truly want to try everything. unfortunately there's only half left! we haven't found it dry but patsy was right about the level of ginger, i think it could take double the amount of chopped ginger (and dry) on the inside and the doubling up of the ginger juice in the 'icing' was a definite yes. the carrot wasn't noticeable - i can't decide if that is a good thing or not (i like carrot - i think there could be a bit more without spoiling the mix. verdict therefore is that with more of all the gingers it's a good'un. i have pointed out to my partner that he'll be in trouble if there's none left by the time i get back from the farm tomorrow. I thought it was a coconut overload too, to serve both dishes at the same meal. Were I a vegan, I might be a bit offended at the lack of imagination. I like coconut and don't think I'd have minded as the dishes were different otherwise, perhaps if I were a vegan I would. I would like to try the cake on it's own before deciding on an accompaniment/topping. Most of the 'snacks' have been pretty straightforward in this series - I don't think it is designed for people already used to looking in the cupboard and having the ability to mix what flavours and textures are available. It can act as a reminder though, I love tomatoes on toast (and with fried bread even more!) but had temporarily forgotten about them. I do get a bit annoyed with her digging in before she has moved away from the serving area but I suspect those of us who live alone have been known to have been guilty of such things - but not served on a pretty plate with a garnish . somehow, i don't think she goes and sits down to eat the rest. i think that's the only mouthful she takes, carries on walking round the 'island', hands it to an assistant, looks in a mirror to remind herself of how much weight she's lost and that the one mouthful was enough to get the taste - and the plate of food goes to the hungriest looking, skinny, young, sound-man. I'm sure you're right ... but if you take it at face value I think the message it gives out is very poor on many counts. Patsy and Scully, do you think I could use stem ginger instead of crystallised ginger as I have a whole unopened jar of it I bought last Christmas for something I didn't make? Can't even remember what it was now.